When I imagine Free Vermont I think of a small European like country, the majestic beauty of its Green Mountains and Lake Champlain, as well as its classic red barns, covered bridges, and picturesque patchwork pattern of small farms, black-and-white Holsteins, tiny villages, little rivers, ridges, hollows, and dirt roads. I also think of small, sustainable, socially responsible, environmentally friendly farms, towns, businesses, schools, and health centers free of government interference. The Free Vermont which I envision will have its own custom designed, decentralized, compassionate, human scale health care, social security, social welfare, and law enforcement systems. It will support a voluntary citizens’ brigade to reduce tension and restore order in the event of civil unrest and to provide assistance when natural disasters occur. Free Vermont will have an efficient network of railroad passenger trains connecting Bennington, Rutland, Burlington, and St. Albans with Montpelier, White River Junction, and Brattleboro with links to Boston, New York and Montreal. I envisage a politics of human scale epitomized by the Vermont village green where people meet to chat, have a coffee, a glass of wine, or a bite to eat; read a newspaper; listen to music; smell the flowers; and pass the time away. As always, the village green will remain neat, clean, democratic, nonviolent, noncommercial, egalitarian, and humane. A mirror image of the way America once was, but no longer knows how to be. And then there is my beloved Northeast Kingdom, the real Vermont. The Kingdom provides a communitarian alternative to the dehumanized, mass-production, mass-consumption, overregulated, narcissistic lifestyle which pervades most of America – an alternative to the politics of money, power, speed, greed, and fear of terrorism. The Kingdom is rural, radical, and green, just like I hope Free Vermont will be. Platform: Secession. 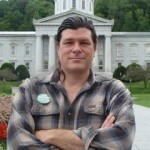 Steele’s an active member of the Second Vermont Republic movement (publishers of Vermont Commons newspaper) and thinks Vermont must secede from the United States to avoid economic and social catastrophe. He believes the United States has lost its “moral authority” and that deepening federal deficits make it a “sinking ship” that Vermont should jump off of. Seceding would keep Vermont afloat, he believes, by reclaiming the $2 billion Vermonters currently pay into the U.S. Department of Defense budget. (Steele served in the U.S. Army for three years in the late 1980s — he joined to get money for college — and served as a helicopter crew chief. We caught up with Steele at Langdon Street Café in Montpelier earlier this week. The most radical antiwar candidate in the US is not Dennis Kucinich or Rand or Ron Paul or any of the usual suspects. 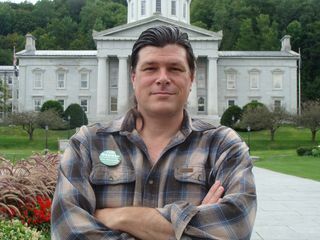 It’s a 42-year-old Vermonter named Dennis Steele, who is running for governor of his state as an open secessionist. From what I can tell, Steele is just an average dude. He wears Carhartts and a baseball cap and drives a pickup truck and lives with his wife and two kids in a little Vermont village called Kirby (pop. 500), off in the wild hills of Vermont’s Northeast Kingdom. On occasion, he feeds his family by hunting deer and butchering the meat himself. He served three years in the US Army — working for “the Empire,” as he puts it — and he tells me his main reason for running is that he doesn’t want his kids serving in the Army. Or any other branch of the Empire. He wants the Empire to drop dead. And he thinks the best way to start that process is by getting Vermont to secede from the union. Destroy the empire by undermining it from within. That’s the goal. This will be a great opportunity for supporters of a Free Vermont to come out and tell the media that we’d like to see fair coverage of Independent candidates! To organize, we’ll be meeting at the Vermont Pub and Brewery at 5pm, and walking over to New Moon at 6:15. We’ll have buttons for those who’d like them (if you already have one, please wear it! ), and will hopefully spend our time at VPB figuring out some good questions to ask. Dennis Steele and many of the other Independent candidates will be there, and Second Vermont Republic founder Thomas Naylor might make an appearance. Please make it if you can! Facebook event page. VYP is hosting an event that will give young professionals the chance to tell local reporters what they want to hear about the election! Listen to local reporters speak about the upcoming race, have a few drinks with friends, and get the chance to offer your opinion about what YOU want to hear in the… news. New Moon Cafe has been kind enough to host this event, with drinks catered by none other than Drink! New Moon Cafe is located at 150 Cherry St.